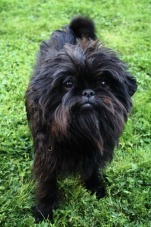 Breed Name: Affenpinscher pronounced, ('Affen - pincher') meaning Monkey Terrier, in German and The French refer to this breed as Diablotin Moustachu which means 'Mustached Little Devil." This is a rare breed in the United States, but has come to the attention of many people in the dog world because of the 2013 Westminster Dog Show’s Best of Show, Banana Joe. The Affenpinscher is a bold, alert, loving and very loyal breed. Additional words that describe his personality include Fun-loving, Spunky, Curious, Adventurous, Stubborn, Playful, and Active. He is inquisitive and intelligent, and generally quiet unless he hears a noise and then you’ll hear a different side to him. He is a companion dogs and need to live indoors near his favorite people. He is the quintessential, small dog with a big attitude. He has no sense of size, so you will need to protect him from himself. He is an active breed that enjoys a daily walk, but much of his exercise requirements can be met indoors. This is one breed that will keep you entertained. This breed tends to conform to the activity needs of the people who love him, so in other words, he will be just as content to sit on the couch as you watch television or take a brisk walk outdoors if you are more of the active type. He can be a little athlete and does well in agility, obedience or rally. His tiny size makes it easy to carry him around, but he is happier walking on his own. As is the case with many small breed dogs, these dogs are difficult to housebreak. Crate training is often recommended for this breed. This breed originated in Central Europe, most likely Germany and France back in the 17th century. He was originally bred to chase rodents in stables, homes, farms, and shops. The original dogs of this breed were much larger. Over time, breeders reduced their size and made them companion dogs. It is thought that they were crossed with pugs, German Pinschers, and a dog called a German Silky Pincher to get their characteristic look. They were later used in the creation of other breeds including the Brussels griffon and Miniature Schnauzer. They are still known to be good at catching mice and other small pests but are classified as a companion dog. These guys need brushing and combing twice a week and plucking a couple times a year. Brushing is best accomplished using a slicker brush and a greyhound comb; both tools that will help keep any tangles from turning into mats. 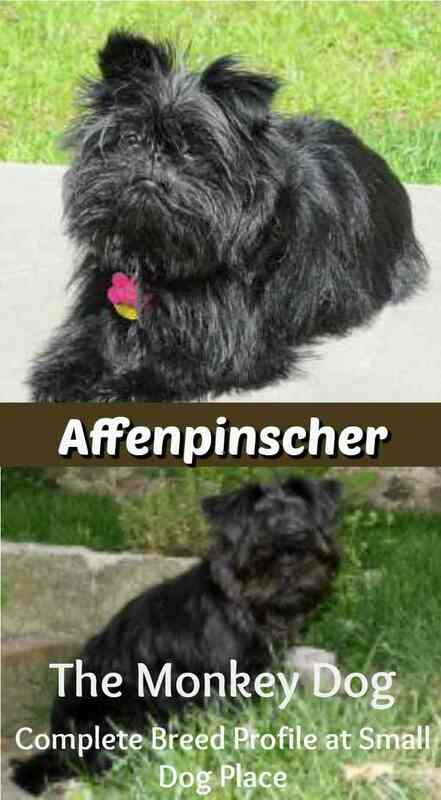 Plucking is usually done by a professional groomer but if you want to do it yourself, there is a very good tutorial at the Affenpinscher Club of America Website. 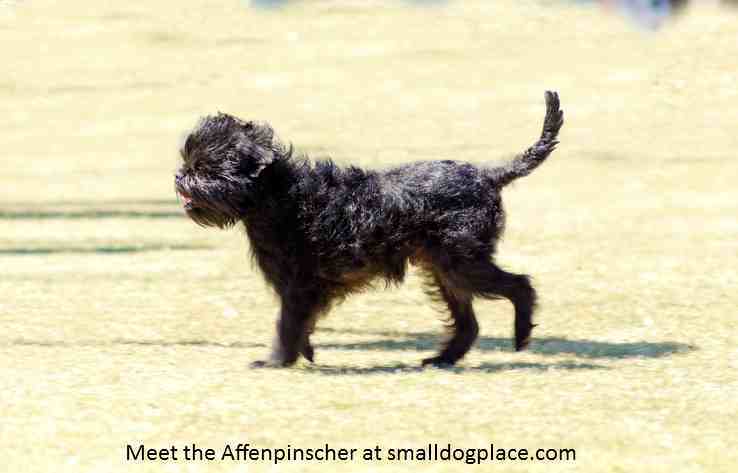 The Affenpinscher has a thick, rough coat with a harsh wiry texture that grows to about one inch long on the body but a little shorter on the rump and tail, and lengthier and bushier on the head, neck, chest, stomach, and legs. The longer fur around the head and shoulders resembles a cape which gives him that characteristic monkey like appearance. They don't shed much which makes some believe that they are non-shedding. They do shed but are considered more hypoallergenic than most. While not a health problem in the traditional disease model, Affenpinschers are most susceptible to injury. Bone fractures are common due to jumping off furniture, falling, or trying to leap out of your arms. They are fast and can be stepped on easily. Choking is also a concern even with very tiny objects. Since they are so small, they can squeeze through even small openings in a fence and be gone in an instant, sadly ending up in the road. Orthopedic diseases such as luxating patellas, Legg Calve Perthes disease and hip dysplasia. Eye Problems include Cataracts, glaucoma, corneal ulcers, dry eye and tear duct disorders. If you are working with a breeder it is recommended that you ask about what tests are performed on the parents. Excellent breeders will run DNA tests, have eyes checked, and get hips X-rayed before making breeding decisions. Affenpinscher or Monkey Dog: The Complete Breed Profile: Is the breed right for you? I love to receive comments and feedback from my site’s visitors—everything helps make this site even better. Why not join in and share your thoughts about what you just read. If you found this article or site helpful or enjoyable, I always appreciate a “Like” or “Share” or a +1. Your “Likes” on our Facebook page help us too.